Newsflash.....after ten wonderful events, the Tomatopalooza management decided it is best for all concerned to take a breather. And so, sadly, Tomatopalooza XI will not be scheduled for summer 2013. There are multiple reasons why we've decided to take a break. First, pretty much all of the core event planners and managers are facing challenges with either health or scheduling (projects, trips, jobs/life, relocations, etc.) With no resources, there can't be an event! In addition, we need to reconsider what Tomatopalooza has grown into and the risks and challenges that such an evolution creates. We've grown from a small event where all participants are also tomato donors to a much larger event taking much more resource and planning that is tilted much more toward tasters than tomato providers. This is simply too risky. Finally, our wildly inconsistent weather, recent summer to summer, makes setting the date near impossible, and severely impacts the possibility of a good supply of tomatoes of great variety. For example, we've moved from the recent dry roast summers to one of cloudy, wet days that bring on lower fruit set and quality and significant diseases in our gardens. So, keep visiting this website to go down the memory lanes of Tomatopaloozas of the past, use the recipes, view the pictures. Once we turn our attention to brainstorming future events, we will let you know and likely request your ideas and input. Have a great summer 2013, everyone - here's wishing you bountiful tomato harvests! and another 24 varieties with 1 vote each (including a number of dwarfs). 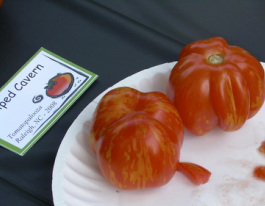 This celebration of heirlooms was conceived by Craig LeHoullier, nationally-known as an expert in the history and variety of old-timey tomatoes, and Lee Newman, one of Craig's very first tomato seedling customers. Craig and Lee thought that it would be fun to bring local heirloom tomato growers together to share tomatoes and taste opinions. (Craig and his wife Susan have been selling tomato seedlings as From The Vine at the NC State Farmers Market in Raleigh each spring for the past 15 years). The annual celebration of Tomatopalooza gives people a chance to learn about our rich horticultural heritage while munching on mouth-watering varieties that have been passed down from generation to generation, linking our past to our future.